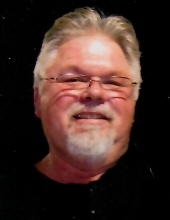 Brian Robert “Beef” Masters, 56, of Herrin, passed away 11:32 p.m. Monday, April 9, 2018 at the Herrin Hospital in Herrin surrounded by his loving family. Brian worked as a tool and dye machinist and engineer for the Sollami Company in Herrin. Brian was very active with the Boy Scouts and was presented the “Boy Scout of the Year” award by Stan Musial in 1976 at the Herrin City Park. His love of music is his legacy, and he played lead guitar and performed vocals for the Rock-n-Roll band, Spectra. Brian was born August 2, 1961 in Herrin, IL to William L. “Bill” and Mary Ann (Miles) Masters. Brian was united in marriage to Lisa J. Sollami on November 21, 2014 in Herrin, IL. Surviving are his wife, Lisa Masters of Herrin; two children, Brian (Tamie) Casey of Macomb, Joey (Micah) Myogeto of Freeman Spur; grandson, Collin Myogeto; step children, Jeremy (Autumn) Sollami of Herrin and their daughter, Mia Sollami; Marissa Agnew and Jerry Mayers of Mt. Vernon and her daughter, Jenna; Ashli (Trevor) Benton of Herrin and their children, Dominik Benton, Lilyana Benton and Ryleigh Benton; five brothers and two sisters-in-law, Bill L. Masters of Indianapolis, IN, Bruce and Kathy Masters of Gilbert, AZ, Bart and Cathy Masters of Shiloh, IL, Mark Masters and Brett Masters of Herrin; sister and brother-in-law, Melinda (Frank) Wheatley of Lakeland, FL; mother-in-law and father-in-law, Virginia and Joseph Sollami of Herrin; sister-in-law and brother-in-law, Toni and Bob Foster of Herrin and numerous nieces and nephews. He was preceded in death by his parents; two brothers, Blair Masters and Michael Wayne “Mike” Masters. Services will be 11:00 a.m. Friday, April 13, 2018 at Meredith-Waddell Funeral Home in Herrin with Rev. Don Colson officiating. Visitation will be from 5:00 p.m. until 8:00 p.m. Thursday, April 12, 2018 at the funeral home. Burial will be in Blairsville Cemetery at Blairsville. To send flowers or a remembrance gift to the family of Brian Robert "Beef" Masters, please visit our Tribute Store. "Email Address" would like to share the life celebration of Brian Robert "Beef" Masters. Click on the "link" to go to share a favorite memory or leave a condolence message for the family.